We are pleased to offer a new Hyaluronic Acid (HA) Filler – Belotero from Merz Aesthetics. Belotero Balance is a new dermal filler designed to integrate into your skin and inconspicuously soften and reduce fine lines. This product is similar to Juvederm or Restylane in that it is a Hyaluronic Acid (HA), but is much softer and suited to treating finer, more superficial lines and more delicate areas of the face, such as vertical lip lines, crows feet, and neck creases. These areas would be difficult to treat with Juvederm and Restylane, because the thickness of these products necessitates their placement in a deeper layer of the skin or just under the skin. If they are placed too superficially, a lump may show or a bluish discoloration may appear. Belotero can be placed successfully close to the surface without these concerns. HA naturally exists as a component of your skin. It attracts and binds water allowing immediate and smooth correction of tiny creases. Belotero does not contain anesthetic Lidocaine like Juvederm, but our early patients have not found the procedure to be too uncomfortable due to the strong topical numbing cream and ice that is used pre-injection. 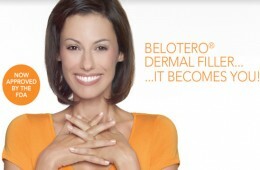 Belotero really “fills” a niche that has been lacking since Collagen (Zyplast, Zyderm, Cosmoplast) were discontinued. This product will last 6 or more months. You may visit www.belotero.com for more information and to read important safety information. A treatment (one cc syringe) of Belotero is $500. Introductory Pricing is being offered until April, 30, 2014. Ask Dr. Sardo if Belotero is right for you!